E-commerce is growing at a very rapid pace in Australia. There are many reasons why your company needs to explore selling internationally into Australia, and this post will explore those details. First, a look at the Australian shopper. With a population of just 23 million, e-commerce in Australia is largely fueled by a stronger economy and infrastructure, rather than the number of consumers. In 2017, e-commerce sales surpassed USD 10.6 billion and sales are projected to grow to USD 15.49 billion in 2021. Australian shoppers are also not shy about buying from global e-commerce sites. 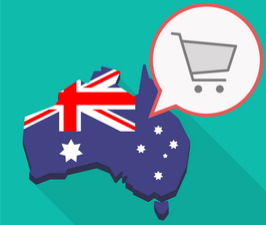 As many as 33 % of Australian e-commerce shoppers buy abroad due to better availability of products while 32 % buy due to the appealing offers, according to Australian digital marketing firm Contevo. With 4.6 million users, Amazon US was the second-most-popular e-commerce site accessed in Australia in October, according to Nielsen Digital Ratings. More than four out of five Australians (85 %) have internet access and the number of users is increasing at a rate of 1.7 %. What’s more, the growth of social media use in Australia has brought new ways to connect with prospects. Additionally, there are nearly 20 million smartphone users in Australia. What makes this statistic a reflection of the opportunity in this country is the high adoption of buying online with mobile devices. Furthermore, last May, the Australian government announced plans to invest another USD 55 billion in more infrastructure “to kickstart Australia’s next growth phase”. The investment will be spread across multiple initiatives including upgrading broadband networks. E-commerce merchants that want to start selling into Australia do need to be aware of a few upcoming changes. To start, the Australian government’s goods and services tax (GST) of 10 % on low value imported goods will go into effect on July 1. International sellers will need to collect the 10 % GST from the Australian customer at the point of purchase. This means low value goods with a customs value of less than or equal to AUD 1000 (USD 757) will also be subject to GST. It also means that international sellers must register for GST with the Australian Taxation Office if they make or facilitate the sale of more than AUD 75 000 (USD 56 805) of low value goods to consumers in Australia in any 12-month period. Despite additional regulations, Australia will remain a hot-spot for international ecommerce sellers. Direct Link looks forward to helping your business thrive in the Australian ecommerce market. We are in a period of transition regarding the last mile and new, fast, exact services. Never before has the last mile, the end delivery to the customer, been so important. Forget drones and automated cars. Instead, take a good look at what consumers really want today. For them, it’s more about making their daily lives easier than pure shopping. E-commerce’s rapid development changes the requirements – and opportunities – regarding the last mile, the final delivery to the customer. Consumer expectations on e-commerce deliveries are changing, and the speed of this change is increasing, not least because of new market participants specialized in handling the last mile, often based on digital platforms. Customers want speed, more choice, and home delivery in the evenings, but the logistics industry is designed to deliver to businesses during the daytime. Yet the new market participants are showing what is possible and are in many cases also good for the environment. In the future, there will be many more delivery services available. You may get five delivery options, with one of these being our own delivery service, another being a bicycle courier, a green option, collect-in-store, and so on. The logistics industry must think differently and open up. We sometimes compete against each other, but sometimes work together with others. From the customer’s perspective, it should be possible to share infrastructure more often. Retail is now being forced to act and provide an omni-channel perspective. Studies show that people born after the year 2000 are not as fond of going to brick-and-mortar stores compared to older people. They use more digital services, and want to have access to a large range of products and be able to conduct comparisons online. Stores will look quite differently in the future. There will probably be more stores that target specific segments and we will see more temporary pop-up stores. I’m looking forward to even more exciting changes in the very near future! A recent International Postal Corporation (IPC) report* shows promising retail e-commerce sales numbers for global cross-border markets. 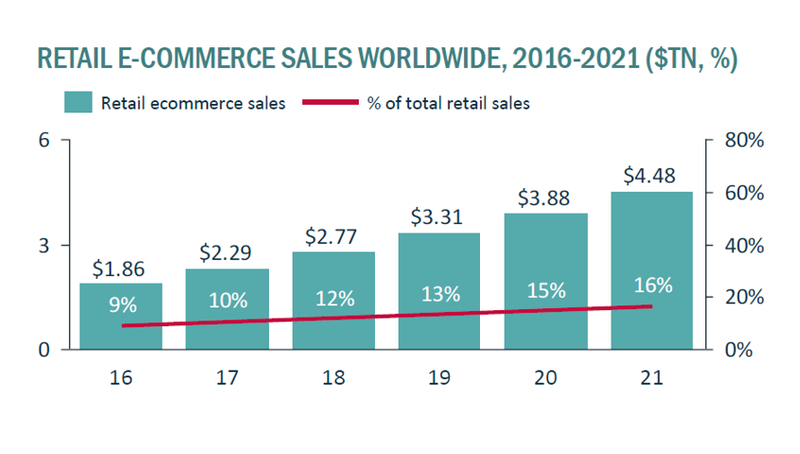 Retail e-commerce sales worldwide is expected to grow 23 % to $2.3 trillion USD in 2017, with the U.S. and China together accounting for $1.6 trillion USD of that total. According to the IPC, this represents almost 70 % of the global e-commerce industry. Western Europe will record the slowest e-commerce sales growth of any region, but still positive at 12%. This brings the expected e-commerce sales value to $337 billion USD in 2017. The U.K. leads the way in the region with projected sales of $110 billion USD in 2017. The Asia-Pacific region shows the highest e-commerce sale growth of any region at 30% compared to 2016. Mobile e-commerce sales in China alone are expected to reach $882 billion USD, up 42% from 2016. This means that nearly three-quarters (73%) of all retail e-commerce sales in the country will occur via mobile – which is the largest share of any country in the world. India’s share of e-commerce sales from mobile comes in a close 2nd at $16 billion USD, a jump of 61% from 2016 and equating to just over a 72% share of total sales. South Korea ranks third in mobile e-commerce sales, with mobile generating 59% of retail e-commerce sales in 2017. For comparison, the total use of mobile for e-commerce sales in the United States is projected to grow 34% in 2017, representing roughly $176 billion USD. The high growth trends in the Asia-Pacific region are mainly contributed to these mobile purchases. In this region, higher internet and mobile usage is allowing consumers to gain access more easily and on a more frequent basis. On the other side, retailers in this region are providing improved shipping and delivery methods to extend their reach. Today, online cross-border consumers are using the power of choice forcing online retailers to make improvements to their consumer’s online shopping experience, via a mobile experience or elsewhere. This can be an important difference-maker this holiday season. For example, in 2016 47% of online shoppers experienced challenges to making a cross-border e-commerce purchase during the holidays that year (based on a survey of 1200 retailers from 8 different countries and 12 000 consumers from 12 global markets). Basic consumer pain points such as a weak shipping and returns process, shipping the right item, accuracy in address and tracking, and proper duty and tax information were all listed as main reasons the consumer felt inhibited. India and Hong Kong experienced the highest percentage of dissatisfied consumers with 73% and 69%, respectively. In China, 64% of online shopper experienced challenges during the holiday season. To meet your consumer’s e-commerce shopping and delivery expectations this holiday season be sure to sign up with a delivery partner that has a well-established global business and can find the best delivery solution for you. Austin Whittenberger – Regional Account Manager in the U.S.
*The “State of E-commerce: global outlook 2016-21” report provided overall e-commerce figures and projections at global and regional levels, including forecasts up to 2021. This report draws from the IPC’s very own case studies, previous cross-border e-commerce surveys and annual carrier reports. Residents of the Nordic countries made e-commerce purchases totaling more than SEK 218 billion in 2016. 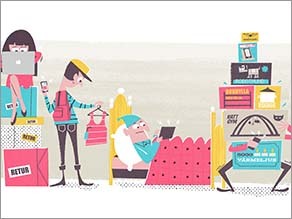 Behind these figures, six distinct types of online shoppers have been identified. Which of these are you? During an average month in 2016, 62 percent of Nordic people aged 18 to 79 made a purchase online. So in what ways do we shop online? The methods are very varied, and depend on whether you like convenience, are spontaneous, have “nerdy” interests or are just busy with everyday life. “Among the different types of online shoppers one can see that the ‘spontaneous’ category is clearly increasing. And considering that every third e-commerce purchase is now made from a cell phone, and this figure is expected to increase further, the ‘stressed’ category is also becoming an ever larger customer group for retailers,” says Retail Specialist at PostNord Sweden, Carin Blom. Behind these statistics there are six distinct types of online shoppers. Which one are you? Claire doesn’t have the energy to go to physical stores. There are so many people, such intrusive shop assistants and it gets so hot when one has a winter jacket on indoors and … yes, the list can get quite long. But sitting in front of the computer at home and buying what one knows one wants is just fine. A few clicks later, the goods are on their way, and Claire does not have to break into a sweat or experience the claustrophobia of shops. Betty has the price comparison sites as her default start page and is well aware that e-commerce is like a great big bargain shop if one has the time to search around and knows how to do it. She is an expert at finding the best price for that vintage dress from Spain, the German table tennis racket or party shoes from China. Harriet shops often and efficiently. Free returns are important for her because she often orders several different sizes and colors, and sends back those that do not fit. It’s just like going into the fitting room at a physical store, but doing it at home. Items that do not fit go back to the store and can be sold again, and those that remain are perfect. Win-win. Peter is looking for the right brand, right feeling, and right specifications. He likes going to physical stores and checking things out, and choosing exactly what he wants before ordering it online. Peter is also interested in what happens after the purchase, such as whether he is offered a club loyalty scheme or maybe a few points that can be redeemed for cool things next time. While just surfing aimlessly about, which quite often ends up in cat videos on YouTube, Spiros suddenly sees a must-have thing that he orders straight away. A few clicks later, the item is on its way to him and Spiros, who can also often spontaneously buy bookshelves from a furniture store when he only actually wanted to buy a candle, can happily continue surfing. Sophie has young children, is a project manager both at work and at home and is active in her leisure time, so active in fact that shopping does not have a very high priority. Instead, she orders the most necessary things online, preferably from her cell phone during a rare calm moment at lunchtime or while waiting for the bus home.